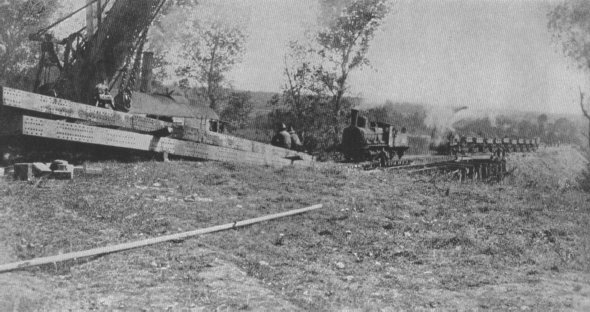 EVERWHERE--ENGINEERSSteam shovel and dump cars of 16th Engineers, on embankment between the canal and the Loire River, Nevers cut-off, Nevers, France. Although often prosaic, the work of the engineers was of utmost importance in winning the war. BARBED WIRE FOR DEFENSEAdvance engineer;s dump. Maj. Pugh, 21st Engineers, and Capt. Crofton, Headquarters, Department of Light Railways and Roads, near Nauginsard. An American offensive is in preparation. 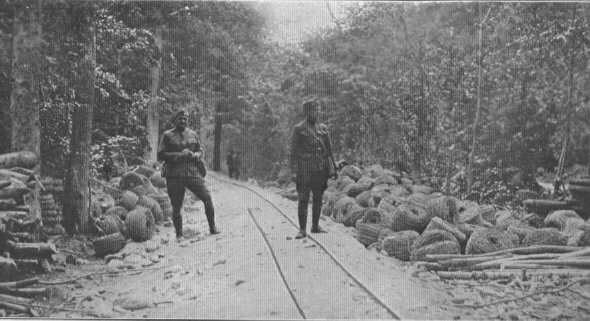 Barbed wire and other supplies are sent up.